I have tried to do both luminance and radiation analysis with HB daylight simulation component. Some problems i met was that I tried two way to input the data of my specific glass type, it supposed to similar output but it didn’t. One is to input data by HB Radiance Glass Material, only input the transmittance data. The result looks pretty rational. But I want more specific for glass parameter definitions, such as solar transmittance and visible reflectance coefficient. 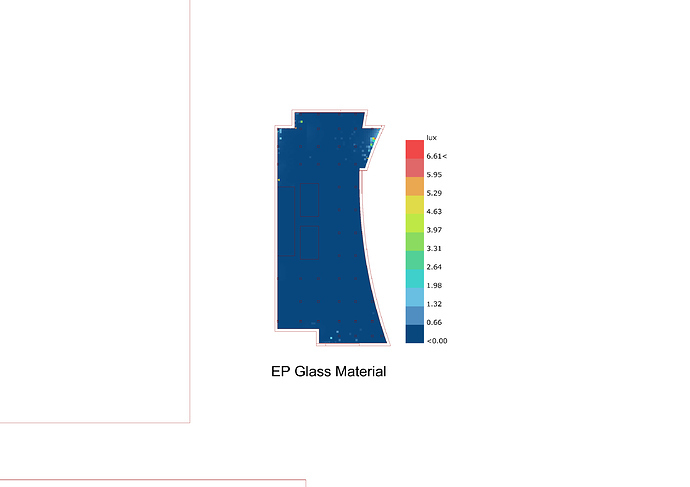 So I tried input data by EP Glass Material. But the result have large difference from the other. In this case which way can I tried to input the glass coefficient in the right way and get more accurate result? 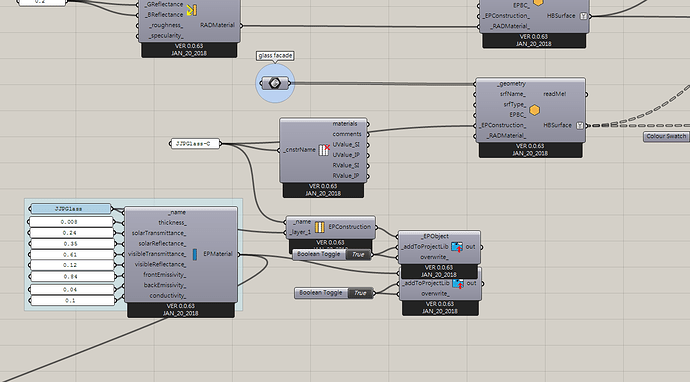 Daylight simulation will only consider the information you provide to the RADmaterial input. For daylight studies, only VLT (Visible Light Transmittance) of glazing will be considered which in your case is 61%. Here, rtn, gtn, and btn are red, green and blue trasnmissivities. As you can see, radiance simply does not use solar transmittance or visible reflectance coefficient. What @devang said and if you don’t set-up the material Honeybee will use the default material for daylight calculation. @devang and @mostapha Thanks for your responses! So won’t daylight simulation consider the material that I provide to EPConstruction with EPmaterial component? However, in the radiation analysis other coefficients beside VLT are supposed to effect results a lot, like solar transmittance in a low-e glass case. How can I set-up other coefficients of transparent material for radiation simulation with Daylight simulation component? If Daylight Simulation will only consider the information I provide to the RADmaterial input, but RADmaterial can’t assign specific data. Is there another way to do the radiation analysis without daylightsimulation component and can consider solar transmittance factors with it? Does it work to switch simulation type between illuminance and radiation by just set-up in the gridBasedSimulation component? Thank you for spending time on dispelling my doubts. The EPConstruction is ONLY for Energy simulations (Energy+). For (day)lighting there is another input, RadMaterials, which you need to define, or default ones will be assigned, as @mostapha mentioned. There are plenty of sources for those definitions (radiance materials). I’m just lazy to bring them here but you can search for them. Use SHGC value to define glass transmittance. Can you please elaborate? I believe even if somebody sets SHGC, it won’t be written to material.rad and therefore won’t affect the simulation. Is that correct? I believe @mostapha’s intention was to set the glass transmittance of the Rad material to the SHGC that you use in EP material. Do you mean transmittance value will be used as the SHGC in the radiation analysis? If you use a climate-based sky and run the analysis for radiation, transmittance value will be used as the SHGC. I believe the intention is that the SHGC will represent the transmittance value … which it really is. Sorry for bringing this subject up again, but I have one more question about using the SHGC value instead of the glass transmittance. In the HB component, the transmissivity is calculated using the user-defined transmittance value (by the formula in the radiance primer: https://www.radiance-online.org//learning/tutorials/radiance-primer.pdf). Should this formula also be used when doing radiation simulations with the SHGC? Or should I just use the original SHGC in this case (by changing the formula in the component)?